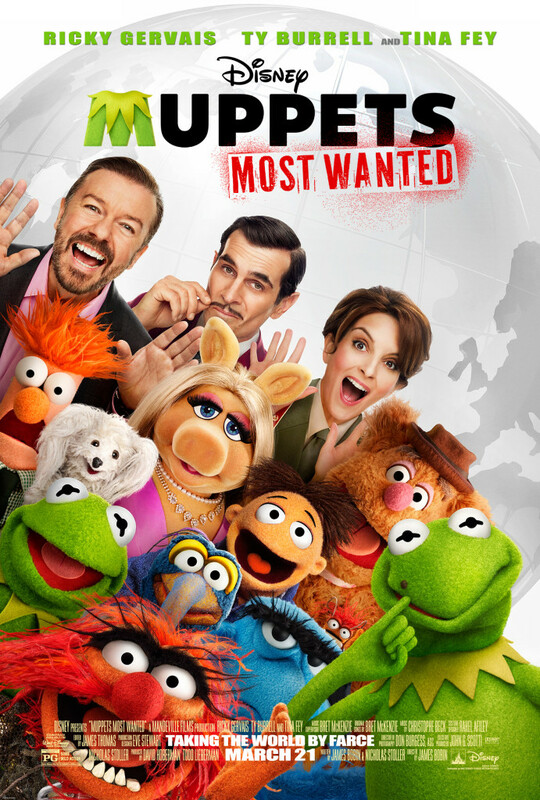 Lacking the inspired comedy of its most immediate predecessor, 2011’s The Muppets, Muppets Most Wanted looks and feels like the obligatory sequel that it is, and thus falls as flat as a Fozzie Bear comedy routine. Kids will like it, and the celebrity cameos should provide a chuckle or two, but Kermit and Co. have certainly given audiences much better. 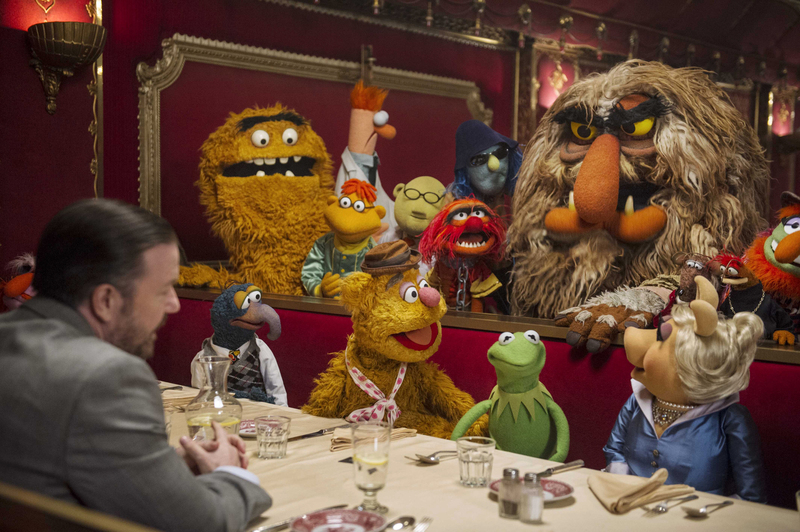 The story literally picks up where the last movie left off, as the newly-reunited Muppets, having just finished making a movie about coming back together, are left with the problem of what to do next. A solution presents itself in the form of entertainment agent Dominic Badguy (Ricky Gervais), who suggests that the group embark on a celebratory world tour and offering to co-manage the Muppets along with Kermit as they book performances in Europe. It’s not long, however, before Dominic’s true motivations behind taking the Muppets on as clients become clear: he’s helping the “world’s most dangerous frog”, Constantine, who’s Kermit’s exact likeness save for one small detail (the marketing for the film makes that detail pretty obvious, so no need to cover it here), and who’s recently escaped from Russia’s most oppressive gulag in Siberia. Kermit soon finds himself mistaken for his doppelganger and occupying Constantine’s old cell, while the dastardly amphibian criminal mastermind steals Kermit’s identity and uses the Muppets’ tour as a cover for his latest, greatest plot: a series of heists that will give him the tools he needs to commit a crime the likes of which the world has never seen a frog commit! Director James Bobin (The Muppets, Flight of the Conchords) does his best to keep a number of balls in the air here, as the action goes back and forth between Constantine’s crime spree, his efforts to keep the Muppets and in particular a ready-to-get-married Miss Piggy convinced that he is, in fact, their often-frazzled leader, and the real Kermit’s own Siberian gulag experience dealing with fellow prisoners and the facility’s imperious warden, Nadya (Tina Fey). There’s also the efforts of crack CIA agent Sam the Eagle and Interpol inspector Jean Pierre Napoleon (Ty Burrell, sporting the most rrrrridiculous French accent and pencil mustache since John Cleese taunted King Arthur in Monty Python and the Holy Grail) to track down the perpetrators of the increasingly bold thefts while not killing each other in the process, and the usual glut of celebrity cameos that are often the most memorable moments in Muppets movies and productions. The fault for Muppets Most Wanted just not working is not in Bobin’s direction — he keeps things moving along the way you might imagine Kermit would when an act during a particular Muppet show was imploding and/or drawing more scoffing from Statler and Waldorf than usual. Nor is the fault the cast’s — everyone, from Gervais to Fey to every single one of the cameo performers, either playing themselves or not, gives their all, regardless of how corny their lines are or how goofy the musical number they’re a part of turns out to be. This is, after all, a Muppet movie; if you didn’t want to play goofy on-screen, you shouldn’t have signed on. Regardless of their collective efforts, however, something, or rather someONE, is missing from the film that turns out to make all the difference in the world: Jason Segal. Segal, who starred in the last Muppets film alongside Amy Adams and Chris Cooper, also co-wrote the film with screenwriter Nicholas Stoller (Forgetting Sarah Marshall, Get Him to the Greek), and while Stoller returned to writing duties for Muppets Most Wanted, Segal did not, and so this time Stoller shares writing credit with Bobin. The resulting script lacks verve and inspiration; the musical numbers are forgettable, the running gags grow tiresome, and the whole thing ends up feeling belabored. What’s worse, the script takes advantage of the story being set in various European countries to go for easy jokes involving cultural stereotypes. The French and the Russians get the worst of the ribbing here, which you’d think might make the bean counters at Disney a little nervous considering how important international box office receipts are these days. Whoops. Will all that be lost on viewers under the age of eight? Probably. But those of you out there who watched “The Muppet Show” as kids, who know the words to “Rainbow Connection” from The Muppet Movie by heart, and can defend the merits of every Muppets production, even “Muppets Tonight” on ABC in the late ’90s (remember Clifford, the host of Muppets Tonight mainly because no one else wanted the job? ), will no doubt be a little disappointed once the credits roll, because you’ll know you’ve seen better. Maybe they’ll do better in the next sequel. Starring Ricky Gervais, Ty Burrell, Tina Fey, and the voices of Steve Whitmire, Eric Jacobson, Dave Goelz, Bill Barretta, David Rudman, and Matt Vogel. Directed by James Bobin. Rated PG for some mild action.